When you combine the flexibility and muscle endurance of Yoga with the strength and muscle toning of resistance exercises, you get Yogacise. Easily achieve relaxing yoga positions utilizing the Health Mark Yogacise. This yoga aid will help you achieve your goals of relieving vertebrae and disk compression, increasing blood flow, improving posture and increasing flexibility. Utilize the multi-positional toning straps and the front toning bars for a full body workout; everything from push-ups to biceps curls. A ‘must have’ piece of equipment for the yoga and fitness enthusiast, whether you use it at home or take it with you to the yoga studio. 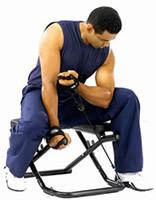 Order your Health Mark Yogacise Bench from FitnessZone.com today!